London Omnibus completed its initial run on Sunday night. 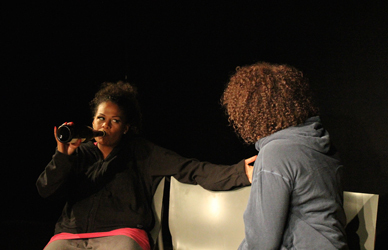 We would like to thank everyone who was a part of this exciting project, and all those who came to see the show. 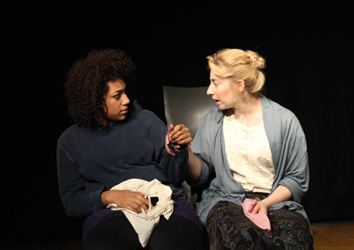 We are delighted to share additional production photos. Above is a photo of the cast at the curtain call on the evening of Friday 10 September 2014. Below are photos of (1) Sharon Ballard and Dani Copperstone in Clocks & Teapots, (2) Dani Copperstone and Jodie Jacobs in Clocks & Teapots, (3) James Law and Dani Copperstone in Lucky George and (4) James Law in Lucky George. 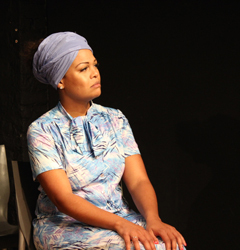 We are excited to share the first London Omnibus production photos. 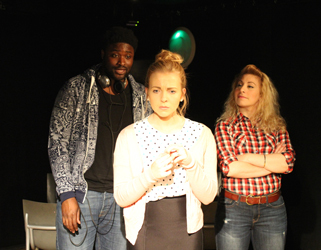 The first photo is of Lekan Lawal, Rebecca Eastham and Jodie Jacobs in The Number One Goes to Canada Water. The second photo is of the full cast in A Hard Working Bus, and the third photo is of Sharon Ballard in A Hard Working Bus. The whole London Omnibus team has been hard at work rehearsing the four plays and preparing for our first public performance on Wednesday night. Wednesday's show will be the world premiere of all four plays: Lucky George by Katherine Manners, Clocks & Teapots by Gus Gowland, A Hard Working Bus by Christina Barrett-Jones and The Number One Goes to Canada Water by Robert Shearman. 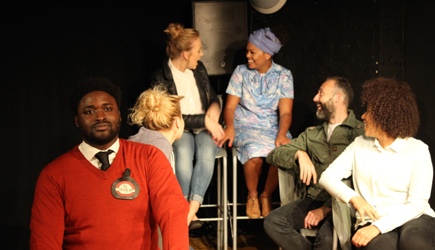 Pictured here are all six cast members: Lekan Lawal, Sharon Ballard, Rebecca Eastham, James Law, Jodie Jacobs and Dani Copperstone. Posted on 9 September 2014. 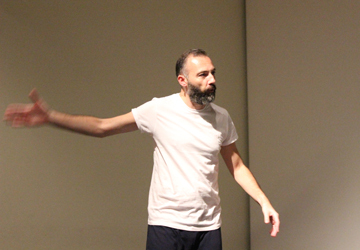 We are excited to share two photos from today's London Omnibus rehearsals. 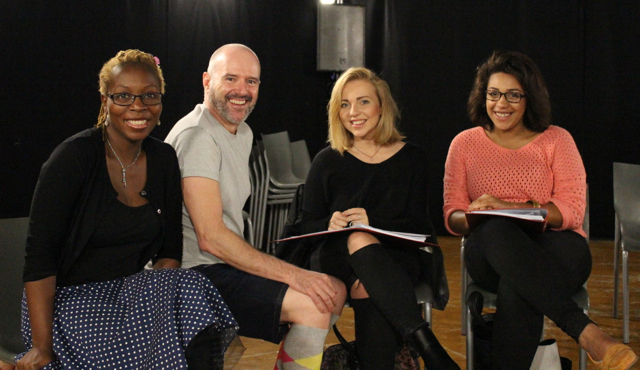 The photo on the left is of writer Christina Barrett-Jones, director Jeremy Lloyd Thomas and actors Rebecca Eastham and Dani Copperstone. 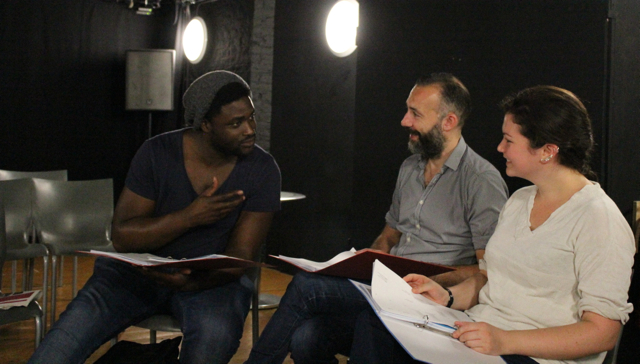 The photo on the right is of actors Lekan Lawal and James Law with director Asia Osborne. Posted on 5 September 2014. We are delighted to announce the cast of London Omnibus: Sharon Ballard, Dani Copperstone, Rebecca Eastham, Jodie Jacobs, James Law and Lekan Lawal. Each cast member will be appearing in at least two of the four plays. For further information regarding the cast members, please visit our cast page. Posted on 3 September 2014. London Omnibus has two directors: Jeremy Lloyd Thomas will be directing the plays written by Christina Barrett-Jones and Robert Shearman, and Asia Osborne will be directing those written by Gus Gowland and Katherine Manners. 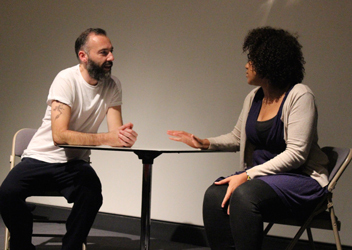 Although the plays have different directors, London Omnibus is a collaboration, and the directors and the producer are coordinating their efforts for the programme, which will feature a number of actors playing very different parts in the different plays. 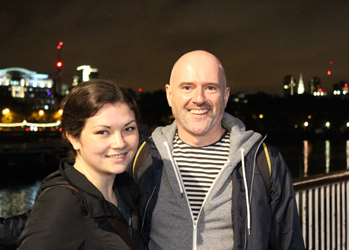 Asia and Jeremy are pictured here on the South Bank after a production meeting. 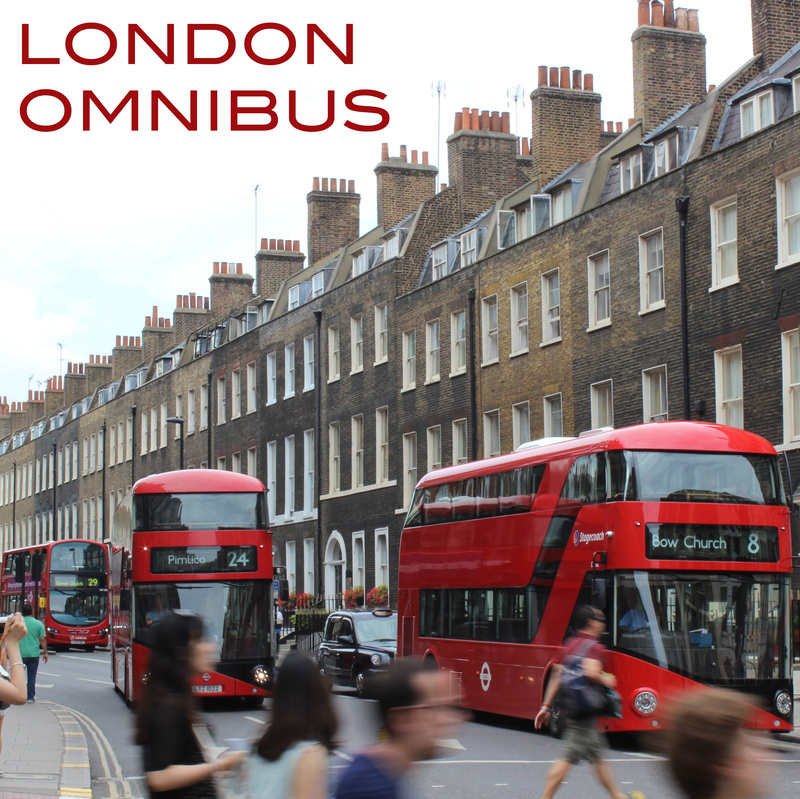 On 8 July 2014, the London Omnibus writers met as a group for the first time. Producer Sue Knox took this photo of the team at the end of this first meeting. Pictured are, from left to right, Robert Shearman, Katherine Manners, Christina Barrett-Jones and Gus Gowland.